“After making her début in Europe in the 1930s, Miss Albanese went on to become one of the most admired sopranos of the mid-20th century. She had a long association with the Metropolitan Opera in New York, where she sang in more than 400 productions from 1940 to 1966. Miss Albanese was what is called a lirico-spinto soprano, with a voice suited both for lyric roles and for somewhat weightier fare. A Puccini specialist, she was known in particular for the title role in MADAMA BUTTERFLY, a part she sang more than 300 times. Her other notable Puccini roles included Mimi in LA BOHÈME, the title role in TOSCA and Liù in TURANDOT. She was also famous as Violetta in Verdi’s LA TRAVIATA, singing the role nearly 90 times with the Met, a company record to this day. Writing in The New York Herald Tribune in December 1942, the composer and critic Virgil Thomson reviewed Miss Albanese’s first Violetta: ‘She used her limpid voice, her delicate person and her excellent musicianship to equal effect in creating the character’, he wrote, adding, ‘I use the word ‘create’ for her achievement because that is what she really did’. By virtue of longevity, Miss Albanese was very likely the last singer of her generation to have been considered a prima donna assoluta — a prima donna so exalted that she exceeds nearly all others in esteem. Her voice was not large, nor, in the opinion of critics, was it unusually beautiful. But what her lower register may have lacked in luster, her soaring top range, with its silvery sheen, more than made up for. Miss Albanese onstage was a sight to behold. Known for her sensitive dramatic interpretations, her nuanced physical gesture, her pinpoint diction in a number of languages and the passionate intensity she brought to singing and acting, she seemed to inhabit her characters — in particular Puccini’s doomed, fragile heroines — more fully than almost any other singer. Her deep preparation for her roles included, for the consumptives Mimi and Violetta, visiting a tuberculosis ward — no small risk for one whose livelihood depended on breath. Rehearsing Cio-Cio-San, the tragic heroine of MADAMA BUTTERFLY, she realized that Puccini had not left sufficient pause in the music so that the character might easily take off her shoes before entering a house, in the traditional Japanese manner. Miss Albanese took her stage shoes home with her, slipping them off again and again until she could do it with all due speed. She was said to have a special talent for mortality. As the INTERNATIONAL DICTIONARY OF OPERA said: ‘Nowhere was Albanese’s mastery of her art more palpable than during the moments that required her to ‘expire’ onstage, something she invariably accomplished with the most exquisite expressivity, whether called upon to demonstrate a gradual, quiet fading away (Mimi, LA BOHÈME); a final feverish outburst (Violetta, LA TRAVIATA); an intense losing battle to cheat death (MANON LESCAUT); or an act of unbearable poignancy such as the suicide of Butterfly’. This approach to the art of sung drama won Miss Albanese rapturous adoration. She spent her prime awash in bouquets at curtain calls, as audience members chanted her name in unison. A coterie of her most hard-core admirers spent years traveling from city to city like camp followers just to hear her perform. Yet she was no diva, by all accounts displaying little of the personal affectation that can come with the territory. ‘Diva? Hah! I was never a diva’, Miss Albanese told The San Francisco Chronicle in 2004. ‘Only God makes a diva. No, just call me a plain singer with lots of expression’. Because she knew better than to attempt heavy works, like Wagner, which can erode the voice over time, Miss Albanese was able to keep singing well into old age. Long after her official retirement, she was heard for decades on every Met opening night at Lincoln Center, her voice ringing ceremonially out from her box with ‘The Star-Spangled Banner’, including an impeccable high B flat. In 1985, Miss Albanese sang the role of the aging diva Heidi Schiller in a highly regarded concert version of Stephen Sondheim’s musical FOLLIES with the New York Philharmonic. That production, which also starred Carol Burnett, Barbara Cook, Elaine Stritch and Mandy Patinkin, is available in a live recording. 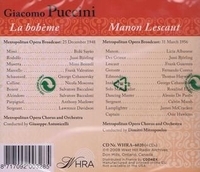 Her many other recordings include a celebrated LA BOHÈME, made in 1946 to commemorate the opera’s 50th anniversary, under the baton of Arturo Toscanini, a frequent collaborator. Miss Albanese also collaborated with some of the most eminent male singers of her time, whose names evoke a grand bygone era. Among them were Jan Peerce, with whom she partnered many times at the Met, and Ezio Pinza, a notorious trickster who made one of her swan songs even more difficult than normal: ‘I remember a BOHÈME broadcast when I kept smelling something terrible in the final scene, where I was dying’, Miss Albanese told The New York Times in 1989. ‘I kept singing, but in between I would whisper to everyone, ‘My God, what is that smell?’ And finally at the end, Pinza pulled a herring out from under my pillow’. Felicia Albanese was born in Bari, in southern Italy, on 23 July, 1909. She began singing as a girl, becoming a pupil of Giuseppina Baldassarre-Tedeschi, a noted Butterfly in her day. Miss Albanese made her début unexpectedly in 1934, at the Teatro Lirico in Milan. At a performance of MADAMA BUTTERFLY at which she was understudying the title role, the soprano became ill during Act I. Miss Albanese was hustled onstage for Act II. A great success, she went on to appear at La Scala, Covent Garden and other European houses. She left Italy for New York in 1939 and the next year, on 9 February, made her Met début as Cio-Cio-San. Reviewing her performance in The Times, Olin Downes wrote: ‘She sounded the note of tragedy and made it the more poignant by the constant light and shade of her dramatic interpretation. There was a real simplicity and contagious emotion in it, and everything was so thoughtfully proportioned that climaxes had never to be forced or passion torn to tatters to make it carry across the footlights’. At the Met, Miss Albanese’s other roles included Susanna in Mozart’s MARRIAGE OF FIGARO, Micaëla in Bizet’s CARMEN, Marguerite in Gounod’s FAUST and Desdemona in Verdi’s OTELLO. She was also a mainstay at the San Francisco Opera, where she sang for many years. Miss Albanese, who became a United States citizen in the 1940s, received the National Medal of Arts from President Bill Clinton in 1995. In retirement, Miss Albanese gave master classes around the world. In 1974 she and her husband, Joseph A. Gimma, established the Licia Albanese-Puccini Foundation, which aids up-and-coming singers. Mr. Gimma, a Wall Street broker and a former chairman of the New York State Racing Commission whom Miss Albanese married in 1945, died in 1990. Besides her son, her survivors include two grandchildren and three great-grandchildren.